GEELONG's mid-season bye hoodoo is "real", while the club also has to address its habit of dropping games to teams below it on the ladder, coach Chris Scott says. The Cats' two-point loss to the Western Bulldogs at Etihad Stadium on Friday night stretched their string of losses after byes to seven, a problem they had sought to address this year with an intensive training camp on the Gold Coast. Geelong entered Friday night's game as strong favourites against a 14th-placed Bulldogs team that had won just four games for the season and was in the midst of a five-game losing streak. But the Cats, seventh on the ladder at the start of round 15, missed a golden opportunity to bolster their position in the top eight, when Harry Taylor pushed an after-the-siren set shot wide to give the Bulldogs a richly deserved two-point win. The winner of the Greater Western Sydney (10th) and Hawthorn (ninth) clash at Spotless Stadium will leapfrog them, while the Cats will be pushed out of the eight if North Melbourne (eighth) defeats Essendon at Etihad on Sunday. Scott told reporters his team had let itself down in the fundamentals of the game against the Bulldogs, cruelling itself with skill errors and poor decision-making while giving up too many goals, especially from close range. The Cats coach did not shy away from his team's poor record after byes, nor from the fact it has too often dropped games it's expected to win over recent seasons. "The competition is really tight. The accusation would be that we don't bring the same intensity to games like this," Scott said. "I'm not sure that the Bulldogs are playing like a bottom-six team right at the moment, but again, I accept that that might sound like a bit of a flimsy excuse. I'm open to ways in which we can fix it. "There's that part of it too – we haven't played well off the mid-season bye. That's real. We have got to look at all the ways in which we can improve that. "So, I mean, the only thing we won't do is turn our back on it and hope for the best. We have just got to keep working to find a way to be better in these sort of games." Scott did not watch Taylor's after-the-siren shot from 40m, which the left-footer pushed well wide, saying: "We've been in enough situations like that, I can't watch. I just wait for the crowd reaction." 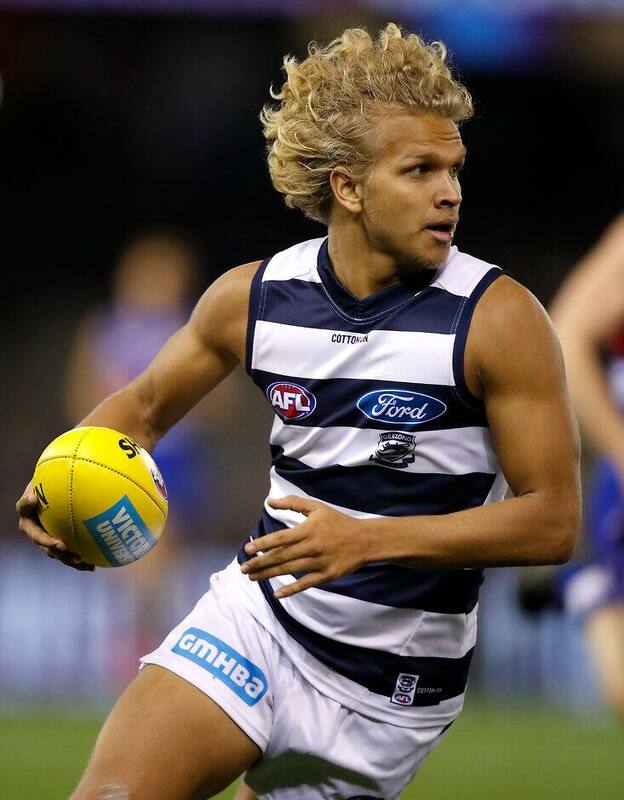 But the Cats coach had spoken with Taylor briefly after the game and was confident the swingman would bounce back well. "My position on these things generally is that you want to be the man in the arena," Scott said. "He was good enough to get the shot. He didn't take it this time, so he will be bitterly disappointed about that, but he was good enough to get it and he wanted the shot. "They don't always go your way, but I'm sure that Harry will be a gracious loser. "It stings, don't get me wrong, but it doesn't always go your way. There's no point being too bitter." On a positive note, Scott was encouraged by Quinton Narkle's debut – "We thought he was outstanding" – and by the strong returns of Taylor (plantar fasciitis) and Cam Guthrie (ankle) from long-term injuries. The Cats coach said Lachie Henderson, Scott Selwood and Daniel Menzel were all in the mix to return for next Thursday night's clash against Sydney at the SCG, although Nakia Cockatoo has been ruled out given he will miss this round's VFL game with illness.